One of the questions that I frequently get asked is what kind of camera I use. All of my pictures posted here thus far (and unfortunately for the foreseeable future) have been taken with one of three cameras: the Canon Powershot A610, Canon Powershot SD900, or the Canon G10. First about camera type - I think I am a die hard Cannon fan I think that they are the best cameras in the non-DSLR camera group. I specify that only because I have not had the opportunity to use the Digital SLR cameras. I would also add that the three cameras that we own have enough functionality in them to be able to use them just like SLR cameras without having to go to that price point and almost retaining the practicality of having a point and shot camera. I also love the extras and features that the Canon lines offers, including: underwater housing (a major requirement for us), the availability of presets on the camera for different situations (such as underwater, fireworks and snow) which works well for using it in quick situations when I just want to snap quick pictures. I also love the durability and ease of use. My daughter, C, manage to use our A610 and our SD900 all the time - she is only 3 years old - and she has taken some good pictures. My largest comment with respect to the cameras is that they are great for every day use but they offer so much more for the money that you spend on them. For example we have underwater housing for the SD900 and the G10 (I believe that they were around $200 for each case) and they are well worth the money. While I believe that they are designed primarily for use in the water - we also use the housing when we are at the beach and when we are playing in the snow. I can say that some of the best pictures we have from the winter months are us making snow angels or throwing snow balls and having pictures of it all without concern for damage to the camera. This also extends to the use on the beach - I never worry about the sand getting into the camera or damaging parts of the camera. Add to that the fact that we can take our camera in the pool to take pictures, or into the ocean when we are snorkeling we are sure never to loose a moment. (1) The camera is fully functional in the housing - meaning that you can easily use all of the buttons to adjust the camera. (I would note my only critique on the G10 housing they did not include a way to use the scroll dial on the back which is a slight downside). (2) Unlike the "waterproof" cameras that are sold out there there is little chance of something going wrong. I say this because I have heard countless stories from people with waterproof cameras having problems with the seals on the cameras, not closing a compartment properly and then using the camera entirely or using the ability to use the camera for an extended period of time. Sounds really good right - because I would think that most families are looking to get the most of what they can out of a camera. We only own cameras and use them for both pictures and video. My only concern was the ability to manipulate the camera in taking pictures and adjusting the settings. All three cameras have the ability to change the settings. The G10 is really a the single step below the DSLR's and it won out over the DSLR because of the cost of the underwater housing. 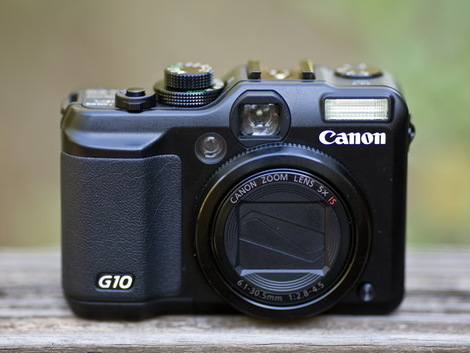 Now I know that Canon has already come out with the G11 - I don't believe that they would have moved backwards at all in the things that make their cameras among our top choices. I would also note that before buying any of our cameras we played with a large variety of cameras at the store and considered the features that we knew that the Canon offers. We looked at how long it takes for the camera to turn on and be picture ready, how quickly you can take pictures and how fast you can switch between preview and picture taking. The canon was by far the best in all three categories.